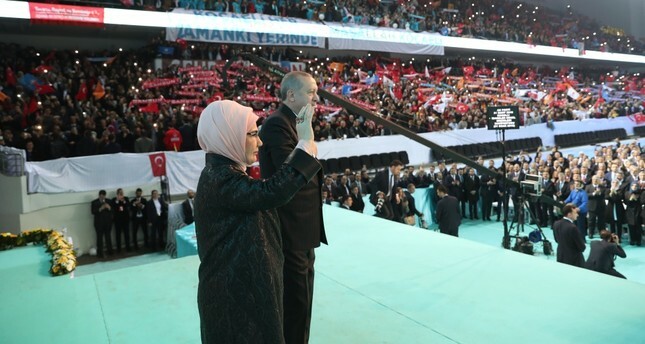 President Recep Tayyip Erdoğan, with first lady Emine Erdoğan, greet AK Party supporters as they arrive at a meeting to announce the party's 11-article manifesto for next month's local election, Ankara, Jan. 31, 2019. Following a decade of fragile coalition governments in Turkey throughout the 1990s, voters reshaped Parliament into a more stable, two-party rivalry in the 2002 general elections when the newly formed Justice and Development Party (AK Party) entered the country's political sphere. Voter turnout for the 2002 election was 79 percent, and the AK Party garnered 34 percent of the votes – the highest among all the parties in the election, but it was also the lowest in AK Party's electoral history. The party managed to attract 46.7 percent of the votes over the next elections in five years in the 2007 general election, a 10 percent increase equaled to nearly 10 million more votes. What this means is that over its first five years as the single party in power, the AK Party managed to convince 10 million people to vote for it. This increase was a topic of analysis in those years, which led to some possible explanations: Some of these 10 million votes came from a demographic rise and some came from higher turnout that year – a rise from 79 percent previously to 84 percent. Obviously, though, these two reasons cannot account for the majority of the 10 million increase in votes for the party, as this increase in votes was not a sign of any increase, as such, but more a sign of persuasion. This trend of higher turnout and voters increasingly backing the AK Party continued in consecutive elections in the following years. Some analyses of this voter behavior from the past 15 years have become a cliché, asserting that a pillar of the Turkish electorate votes for stability. Additionally, civilian support for democracy against military intervention or other sources of tutelage, as Turkish politics had so often seen in the past, was now another permanent pillar for understanding voter behavior. What this means, however, is that these two pillars are now established and therefore no longer useful for understanding how new swing voters vote and why and where differences occur and the characteristics of the grey areas. We can say that three groups need to be "persuaded" for the upcoming local elections. The first is young voters voting for the first time who have grown up seeing no other party but the AK Party in power; they now number in the millions. The second is Kurdish voters, who often fluctuate and are affected by multiple, simultaneous factors. Last, the growth of a demanding middle class in big cities which has benefited from the AK Party's reforms, yet still asks for more. In the June 2018 presidential and parliamentary elections, President Recep Tayyip Erdoğan received 52.6 percent of the votes, while the AK Party received 42.56 percent, further benefitting from its electoral alliance with the Nationalist Movement Party (MHP), which garnered a further 11.1 percent of the votes for what was dubbed the People's Alliance. Still, the vote disparity between the party and its leader was 10.04 points. Some analysts claim that the AK Party secured 30 percent to 35 percent of its votes from its diehard base, and the gap could be interpreted as voters' different views of Erdoğan and the AK Party, which means some AK Party voters make a distinction between the party and its leader. It is still too early to tell how this analysis will play out in future presidential and parliamentary elections, although the backing of a strong leader is also a valid pillar in Turkish politics, and these aforementioned pillars need not compete with each other. The trajectory of AK Party votes will become clear in the upcoming March 2019 local elections, though, and voter behavior for these upcoming elections is shaped much more by local dynamics and individual candidate profiles and party loyalty. For the first group, the number of those entering the voting bloc for the first time has increased by 4 million from 2015 to 2018, and many recent polls show low support for the AK Party from young voters, who have been said to be reluctant to get involved in politics and generally have a lower turnout. Politics in Turkey is shaped by two poles with clear red lines. Young people's views and their lack of political consciousness may lead to the young generation's difficulty to adapt to this black and white political environment. Even though the AK Party is not in a life-and-death situation concerning young voters' views, the millions of first-time voters will become a constituency, or many, in the coming years. The second challenge concerns the Kurdish electorate, and as the Kurdish voter map changes, this voter base is often vague and unpredictable. Kurdish voters made a great difference in the 2018 elections for the AK Party when previous Peoples' Democratic Party (HDP) voters switched to the AK Party in some eastern provinces, most notably in Bitlis, and voted to re-elect Erdoğan as president. Again, however, there may still be a difference between Kurdish voter behavior and its dimension in national and local elections. Kurdish voters may vote in local elections according to their own local concerns more than anything else. Since Kurdish voters still see the other opposition parties, such as the Republican People's Party (CHP) and Good Party (İP) as anti-Kurdish, the AK Party is left as the HDP's main competitor for Kurdish votes. Erdoğan's relations with many Kurdish constituents are still vivid and strong, but AK Party votes from this constituency could also be affected by the local candidate profile. Another challenge is the growth of the new middle class and social changes among urbanites. The cultural and economic changes driven by 15 years of the AK Party's developmental policies have led to great progress in big cities, but the outcome may not serve the AK Party's purposes. Amendments in health services, the increase in those with a university education, the increase in those who study abroad and the expansion of housing and complex mortgage systems have created a more demanding and expectant middle class, sometimes angry and sometimes unwilling to share any burden. This new middle class is good for the economy – both consumers and producers – but may not be considered responsible and ideal for urban citizens. The middle class in cities always mentions intractable traffic, high tax rates, lack of family and other housing, problems with education and schools, domestic migration and refugees, the severe lack of green space and other public leisure places rather than their own beneficial relationship with their cities. These demands from those new to the cities, sometimes angry and full of expectations, are also a problem the AK Party has created for itself. These three groups may vote for and back Erdoğan, but young voters and the contingencies in the large and medium urban areas may still be reluctant and hesitant to vote for AK Party candidates. As for Kurdish voters, the concerns of the AK Party and those of specific areas my not coincide.